Fierce opposition intensified across the nation to the Employment Relations Amendment bill, which passed its first reading in parliament on June 5. National government’s proposed changes to employment law are opposed by unions, the Labour Party, the Greens and NZ First. Despite the opposition, the bill passed by 61-58 and was sent to a select committee for public submissions. Among the most controversial changes is the lifting of the obligation on employers to conclude collective bargaining. Under the bill, employers can opt out if they consider negotiations are taking too long and aren’t getting anywhere. Another clause removes guaranteed meal and rest breaks, instead allowing flexible working arrangements to be negotiated on an individual basis. 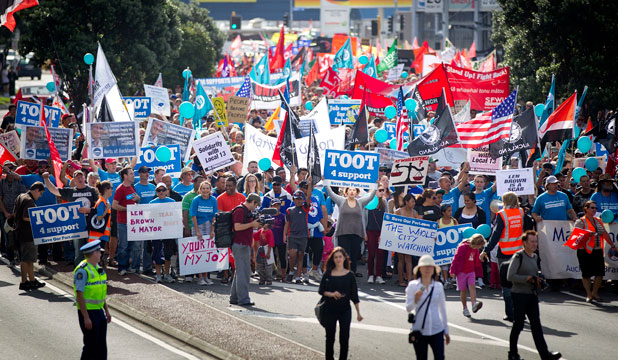 Unions also have raised the concern that the measure violates New Zealand’s obligations under ILO Convention 98 on the right to organise and collective bargaining. National government’s proposed changes to the Employment Relations Act sparked heated response from New Zealand’s unions. A sample of comments from union leaders indicated the depth of opposition. The Service and Food Workers Union said the changes will further weaken the ability of workers to maintain their wage rates and working conditions. “The changes are a brutal reminder that the Government wants to entrench a low-wage regime in this country and make life for low-income working families even more insecure,” said SFWU spokesperson, Jill Ovens. The Engineering, Printing and Manufacturing Union warned the measure means a low wage future for Kiwi workers. “We will campaign to stop these changes and build support for fairer employment laws that provide every worker with a safe workplace, a living wage and a real say at work,” said EPMU director of organising Rachel Mackintosh. 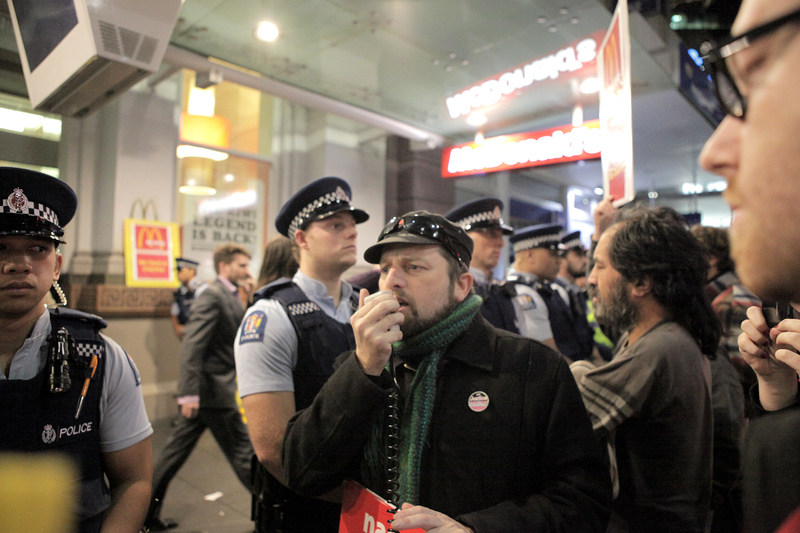 Unite union, which organises fast food and other previously unorganised sectors, launched a vigorous industrial campaign against McDonald’s with the first McDonald’s strike ever in Wellington on May 22. Five of seven workers on the morning shift at Wellington came off the job and, according to media reports, most customers respected the picket line. 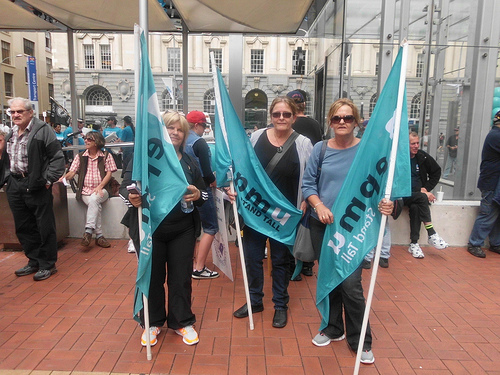 Workers were joined by community groups and trade unionists from FIRST Union, the Postal Workers Union of Aotearoa, the NZ Nurses Organisation and the New Zealand Tertiary Education Union. 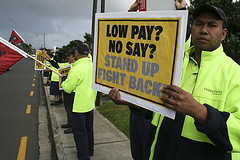 The union’s SupersizeMyPay.com campaign in 2005 achieved collective contracts in most of the major fast food chains: McDonalds’, Burger King (Hungry Jacks in Australia) and Restaurant Brands (KFC, Carls Jr, Starbucks, Pizza Hutt). The key demands today are focused around winning a NZ$15 starting wage, an end to casualised hours, a fair and transparent roster system and a number of union-only benefits, most of which have already been won by KFC Unite members. Charter schools are “part of the problem, not part of the solution,” stated more than 50 representatives recently of groups the government claims charter schools will help. In a letter to Education Minister Hekia Parata, the groups expressed “our deep concern that this initiative is a serious wrong turn for education.” Signatories include spokespeople for the Maori and Pasifika communities, IHC, Every Child Counts and the Child Poverty Action Group, as well as academics, principals, teachers, psychiatrists and members of parliament. Group spokesperson Waikato University Professor of Maori Education Russell Bishop said the government’s charter school plans is “a serious wrong turn for education” that exploited vulnerable children. “Charter schools are not the solution for New Zealand’s most vulnerable learners. Overseas, charter schools have not raised achievement for children who need it the most,” the groups said in the letter. A 2012 Expert Advisory Group on Solutions to Child Poverty claimed 270,000 New Zealand children are living in poverty, including 100,000 in working families. But a plan by the National government for a five-year $9.5 million programme to ensure every school that needs to can provide breakfast for its students has been decried as too little. Critics say child poverty drains the nation’s economy of billions each year. EAG estimated child poverty costs $6 to $8 billion a year, about $1,800 per man, woman and child. The most commonly used thresholds of poverty are 50 per cent and 60 per cent of median household income after housing costs. In 2012 median weekly household income in New Zealand was $560 and median working income was $800. With average rents at $300, poverty in New Zealand means having $130 to $250 per week to spend on utilities, food, clothes and other expenses. Food in schools was the 63rd of 78 recommendations by EAG to the government to address child poverty. More than 1,000 workers from Sabrina (Cambodia) Garment Manufacturing factory protested June 6 to demand the release of eight union members arrested on the previous Monday. The representatives of the Free Trade Union (FTU) were charged were with intentional violence and intentional property damage. Strikers at the plant recently engaged in factory protests during which 23 people, including nine police officers were injured in clashes that occurred. The plant is a Nike supplier. Workers said they would continue to protest until the FTU representatives and workers were released. Ny Dyna, wife of a detained FTU representative, said she had not been allowed to see her husband. “They did not allow even the food I brought to get to him. It was also denied,” she said. Turkey’s Public Workers Unions Confederation (KESK) launched a 2-day strike on June 4 in support of protesters demonstrating for weeks against the Islamist government of Prime Minister Recep Tayyip Erdogan and his AK Party. The confederation represents 11 unions with 240,000 members. “The state terror implemented against mass protests across the country … has shown once again the enmity to democracy of the AKP government, said KESK in a statement. Protests rocked the country in early June with rallies, demonstrations and marches. Erdogan dismissed the protestors as “extremists.” Police clashed with protesters with thousands injured or detained, and three people dead, including a police officer. The protests were sparked over redevelopment in Istanbul’s Gezi Park which revealed widespread dissatisfaction with the government’s repressive policies. Anti-austerity groups from across Europe gathered in Athens June 6-7 for a two-day summit where they called for radical changes in policies from western governments. Organisers said the event is an act of solidarity with Greek social movements in their struggle against austerity. During the summit, Greek health workers led a protest in front of parliament over government spending cuts which they say have caused the collapse of the nation’s health care system. They were joined by health care workers from France, Belgium and Portugal. Workers said wage and staff cuts have increased their work load and made their jobs impossible. The summit forum called for fiscal pacts imposed on indebted countries to be cancelled, for a moratorium on debt repayments, higher taxes on the rich and more scrutiny of offshore accounts. The meeting took place after the release of an internal International Monetary Fund report which faulted the drastic austerity measures imposed on Greece, and said debt should have been restructured in 2010. Explosions and fire tore through parts of a poultry processing plant in northeast China, killing 119 people and injuring 54. More than 300 workers were inside the plant operated by the Jilin Baoyuanfeng Poultry Company. According to news reports, fire doors were locked to prevent workers from walking around and disrupting production. Some employees said that as 70 per cent of the workers were women, the doors were locked to prevent them from going to the toilet too often. Panicked workers were forced to escape down a narrow hall to a side door exit. Authorities said the explosion was caused by leakage in tanks of ammonia, which is used in the poultry industry as a coolant. China’s poultry industry is notorious for unsafe working conditions, with air and noise pollution, exposure to high temperatures, unpleasant smells, poultry blood, feces, and disease. Jilin Baoyuanfeng Poultry, founded in 2009, has 1,200 employees and an annual output amounting to 67,000 tons of chicken products. Bangladeshi garment workers have conducted on-going protests and strikes that have reduced garment production in Ashulia by 20 per cent since the Rana Plaza catastrophe. The Ashulia plants account for 30 per cent of Bangladesh’s total garment exports. Police on June 3 used rubber bullets and batons against some 3,000 garment workers of Dynasty BD Limited in Ashulia and Gazipur industrial belts, on the outskirts of the Bangladeshi capital Dhaka, during a protest after they walked out. The workers demanded payment of overdue wages, other financial benefits and immediate withdrawal of the cases filed against workers as a result of a previous industrial action. According to news reports, at least 50 workers were injured. Dynasty Group suspended production at the plants for several days as a result of the labour unrest. On April 24, Rana Plaza, an eight-story commercial building in the Greater Dhaka area, collapsed killing nearly 1,127 garment workers, considered to be the deadliest garment factory accident in history. Corrections Association New Zealand president Beven Hanlon urged greater safety measures for prison officers after 29 high-security inmates rampaged through two cell blocks at Spring Hill prison in Waikato for more than eight hours on Saturday, June 1. He called the incident the worst prison riot in 15 years. Three guards were left with broken bones. “We’re lucky that nobody was killed,” he said. An out-of-control fire forced staff to free prisoners locked in cells and get the rioting under control first, Hanlon said. “There were flames everywhere, screams and yells, and the staff went in and put those prisoners down very quickly.” Hanlon also praised the work of officers who kept other prisoners under control, after they tried smashing their way out of their cells. He said the union is making suggestions to Corrections in terms of officer safety around prisoner placement, gang management and how staff is equipped. Security screening staff at Perth Airport’s Qantas terminal went on strike June 4 for 48 hours after their employer, MSS Security refused a union wage claim. The workers’ union United Voice and MSS Security have been trying to negotiate a new agreement for six months. 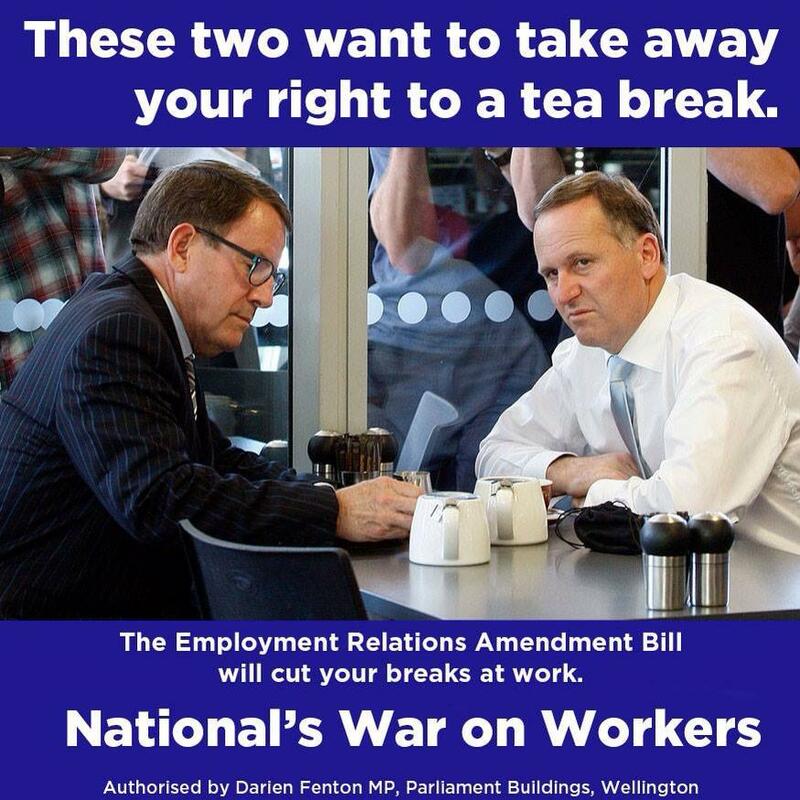 Both sides recently appeared before the Fair Work Commission with no resolution. The workers say they have been offered lower wages than their Melbourne counterparts. According to United Voice assistant secretary Pat O’Donnell, the workers rejected the company’s offer of a 3.2 per cent wage increase each year for four years. The union has called for a pay increase of 8 per cent, 6 per cent and 6 per cent a year over 3 years, plus increases in shift allowances and weekend penalties, which MSS Security refused. The New Zealand Labour Letter is produced as a service to the labour movement by AIL of New Zealand Ltd.
Forest safety campaign intensiﬁed as FIRST Union General Secretary Robert Reid called for a government inquiry to address the alarming rate of injuries and fatalities in forestry. Three forestry workers have died since January of this year, the union said, and “deaths in forestry are of the magnitude of a Pike River disaster every 6 to 7 years.” Meanwhile, the Council of Trade Unions launched a “What Killed Ken Callow?” billboard on Auckland’s Khyber Pass on April 4, part of a campaign calling for Minister of Labour Simon Bridges to initiate an investigation into forest safety. 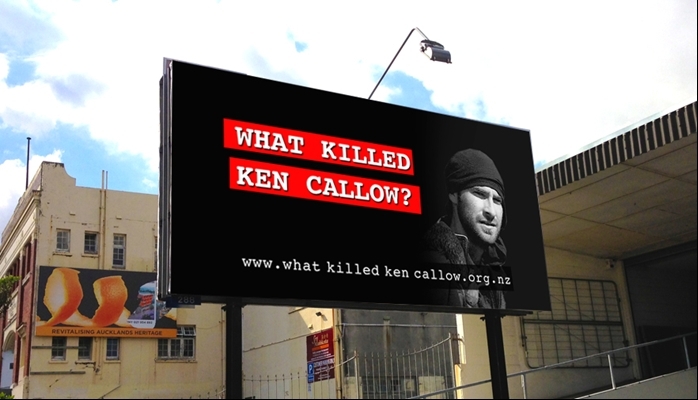 The billboard is funded by donations across the country through OneBigVoice.Com. Gisborne forestry worker Ken Callow died in 2011 and his parents were in Auckland for the launch. New Zealand Education Institute said the government should “open the books” on groups that want to set up charter schools. The union appealed to the Ombudsman after the Ministry of Education refused to release a list of groups that have indicated an interest in setting up charter schools. “The proposed charter school legislation and authorising processes had no provision for consultation with the communities or other schools in areas where charter schools might be set up. It makes sense that local people and schools should be able to ﬁ nd out as early as possible what the impacts might be for them,” said NZEI Te Riu Roa president Judith Nowotarski. NZEI said the Minister’s decision “is an example of the lack of transparency” and accountability throughout the introduction of the National/ACT charter school policy. “This is privatisation through the back door without any mandate and without accountability, given that charter schools will not be subject to the Ofﬁ cial Information or the Ombusdmen Acts,” Nowotarski said. Labour groups strongly criticized a bill the government is preparing to pass that will introduce sanctions, drug testing and other draconian measures to pressure unemployed workers back into the job market. Eileen Brown, Council of Trade Union Policy Analyst, said the bill is based on the “false ideas that unemployed people don’t want to work” and that enough jobs exist for everyone. “It’s already hard for families who are looking for work; these changes only make it tougher for them to get by. We have 163,000 ofﬁ cially unemployed, 284,000 jobless and 111,000 wanting more work. We are seeing large scale redundancies,” she said. She said the “threat of sanctions and other punitive measures” will force people into low quality, low paid, high risk jobs. “The Government needs to gear itself to job creation and support for people who are out of work and at risk of losing their jobs. Instead these will introduce sanctions and bring in draconian measures like drug testing that even their ofﬁcial advice was against,” she said. Public Service Association national secretary Brenda Pilott said, “the conveyor belt of job cuts in the core public service” should raise concerns in the public mind. “What is the impact of these cuts on people who work in those services and are coming under greater pressure? And secondly, are the cracks beginning to show in terms of the quality of service delivery,” she asked. She noted that the Pike River inquiry found that the number and level of support for the mine inspectors was a part of the picture there. Under National, the size of the total public service has dropped 45,297 to 43,345. In addition, around 2500 vacancies exist across the core public service, a ﬁ gure largely unchanged over several years. Creation of a Crown stand-alone health and safety agency, a key recommendation of the Royal Commission on Pike River, received universal praise from New Zealand’s unions. “Creating a stand-alone agency will also give health and safety the more singular status it deserves,” said Public Service Association National Secretary Richard Wagstaff. Council of Trade Unions President Helen Kelly welcomed the announcement and pledged “the union movement is committed to working with the Government to improve the health and safety of our workforce”. She noted New Zealand has an accident rate at work that is twice that of Australia and seven times worse than the United Kingdom. Minister Simon Bridges said the new Crown agency will enforce workplace health and safety regulations and work with employers and employees to promote and embed good health and safety practices. He said the new agency would set a target of a 25 per cent reduction in workplace fatality and serious injury rates by 2020. Legislation to establish the agency is expected to be introduced to Parliament in June and the agency will be in place by December. The Rail and Maritime Transport Union expressed disappointment that the government will not conduct an inquiry into a deal between KiwiRail and a Chinese firm to purchase rolling stock. Auditor-General Lyn Provost will not look into the purchase because KiwiRail made the decision for “normal business and commercial reasons.” The union’s general secretary Wayne Butson said an investigation should have been held to determine whether KiwiRail considered its obligations as a state-owned enterprise operating for New Zealand’s best interests. He charged this decision is the latest example of the Government’s lack of interest in using KiwiRail to support jobs. KiwiRail last year purchased freight wagons from China Northern Locomotive and Rolling Stock Industry Corporation because its price of $31 million was the cheapest. KiwiRail’s own workshops in Dunedin at the time put in an unsuccessful tender for $37 million. New Zealand’s dollar is overvalued and the government must take action to achieve a balanced exchange rate, said the Engineering, Printing and Manufacturing Union. The union responded to Finance Minister Bill English’s claim that bringing down the New Zealand dollar would mean a cut in real wages. “Workers and employers are united in calling for action on the exchange rate because we see first-hand the damage the high dollar is doing to New Zealand’s manufacturing sector,” said EPMU National Secretary Bill Newson. He said a high wage economy needs a balanced exchange rate and a strong manufacturing sector. “The reality is imported consumer goods don’t drive wage growth. High wages come from having a strong productive sector and good employment laws that ensure the benefits of growth are shared with workers,” he said. A new report released by the Family Centre Social Policy Research Unit identified $18.40 an hour as the living wage for New Zealand. The report was prepared by Charles Waldegrave and Peter King, who are best known for their work in establishing the New Zealand poverty line. “The report establishes a minimal figure for a worker in New Zealand not only to provide the basic necessities but to have a decent, but modest family and community life,” said Waldegrave. The report received strong support from across the community. “The report confirms what workers have increasingly been saying. They can’t live on the minimum wage and this provides evidence that workers need at least $18.40 just to get by in New Zealand,” said Service and Food Workers Union National Secretary, John Ryall. Labour Leader David Shearer said the Labour Party would champion the living wage alongside community groups “to do what we can to support the movement.” The campaign for a living wage is a joint community and union effort. 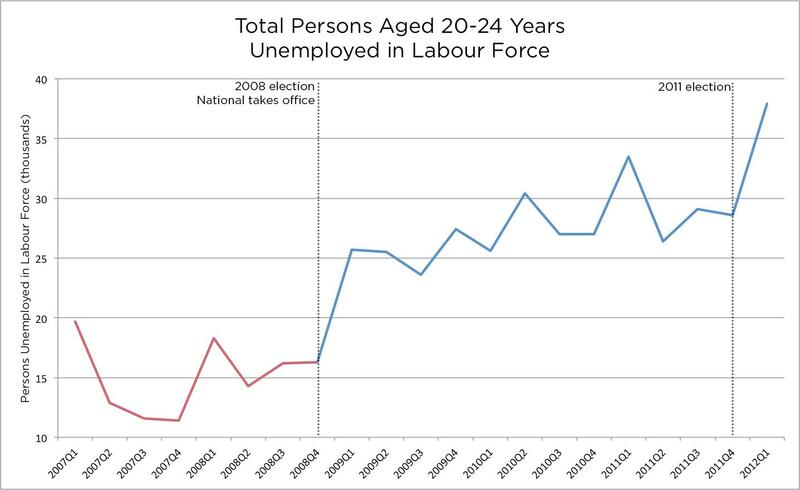 NZ Labour Party charged the national government is failing young people after releasing information that shows more young workers are claiming the unemployment benefit in every region of the country than when National took power in 2008. According to figures collated by Labour, the biggest increases were in Nelson-Marlborough-West Coast, Taranaki-Whanganui-King Country, East Coast, Bay of Plenty and Northland, all up more than 100 per cent between December 2008 and December 2012. Labour MP Jacinda Ardern said National pledged youth unemployment was a main priority but both the youth unemployment and NEET rates are higher than when they took office. “Every young person should have a plan when they leave school,” she said. Instead the Government was restricting youth transition services, which offered support to young people looking for training or employment, a select group of 16 and 17-year-olds, Ardern said. Canada’s unions called for higher pension payments from the Canada Pension Plan (CPP) and other pension reforms as federal and provincial officials recently gathered for a week-long national summit on pensions to address the nation’s retirement crisis. In recent years, tens of thousands of Canadian retirees have seen their pensions wiped out during bankruptcy proceedings. Under the current rules, working people who’ve paid into pension plans have little protection when their employer goes under. Meanwhile, fewer than 40 per cent of Canadian workers are covered by an employer pension plan while the CPP covers only half the average wage of the public pensions that exist in most high-income countries. Canadian labour has called for doubling CPP benefits over the next seven years and protecting employee pensions in bankruptcy proceedings. 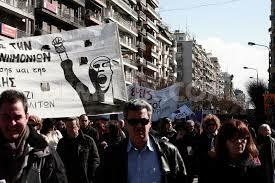 Tens of thousands of Greeks took part in the first general strike of 2013 on February 20 in a fresh round of protests over austerity measures. The strike shut schools and left hospitals with emergency staffing. Domestic flights and long-distance train services also were cancelled. The 24-hour walkout was called by Greece’s two biggest trade unions, representing half the four million-strong workforce. According to news reports, crowds marched towards parliament in Athens where minor clashes broke out at one stage when police fired tear gas at hooded youths throwing stones. Demonstrations also took place in Crete and in the second largest city of Thessaloniki, where some 17,000 people protested peacefully. Ilias Iliopoulos, Secretary-General of Adedy public sector union, said the strike was an attempt to “get rid of the bailout deal”. “A social explosion is very near,” he said. The strikes came days before international lenders are due in the capital to discuss the next instalment of a bailout. Eleven major Indian unions waged a two-day nationwide strike February 20-21 that paralysed banking and transport services across India, according to news media reports. 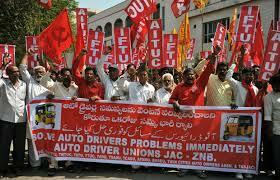 Centre of Indian Trade Unions (CITU) President A.K. Padmanabhan and All India Trade Union Congress (AITUC) General Secretary Gurudas Dasgupta said the action drew an “overwhelming response” and was “unprecedented.” The unions have demanded concrete measures for containing inflation, job creation policies, universal social security, and raising the minimum wage to Rs. 10,000 per month. “All the central trade unions congratulate the working people of India for their overwhelming and magnificent response to the united call for two-day country wide strike,” Dasgupta said. The U.S. International Association of Auto Machinists and Aerospace Workers (IAWA) entered into a formal alliance with the Australian Workers Union to take on multinational companies and “union-busting” political parties. The alliance, similar to the one entered into with the U.S. United Steelworkers eight years ago, was recently approved by the AWU’s 500 national conference delegates. AWU National Secretary Paul Howes said his union would learn from industrial bodies in the U.S. how to campaign and engage with communities. IAWA President Thomas Buffenbarger told the conference that the alliance “could not come at a more critical time.” “Above all, it … means taking it right to those companies that are hell-bent on union busting and their political cronies who make it easy for them to think that they could be successful,” he said. The AWU is the nation’s oldest and largest blue-collar trade union representing more than 135,000 working men and women and their families. FIRST Union reported ANZ in New Zealand plans to send 36 Auckland jobs to Bangalore. The jobs will be in the financial institution’s lending services unit. Union representative Robert Reid said bank officials recently met with the union and staff over the proposal. Reid said 14 news jobs will be created, “but that still leaves a net loss of 22 jobs.” He was told the proposal will take effect from mid-July if approved. FIRST Union went public with the proposal after reports that ANZ in Australia planned to offshore 131 back office jobs mostly from Sidney. Sixty staff would be redeployed while 71 others would lose their jobs. “In both the New Zealand and Australian cases, these job losses caused by offshoring are completely unnecessary, given the profitability the bank is enjoying,” Reid said. ANZ in New Zealand is one of the country’s biggest companies, employing nearly 20 per cent of all employees in the New Zealand finance and insurance sector work. 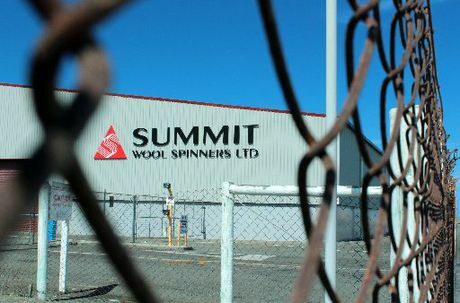 After 130 years in operation in the North Otago town of Oamaru, Summit Wool Spinners closed. The plant’s 192 staff will be made redundant, although some jobs could be rehired by new owners, according to news reports. The workers are represented by the Engineering, Printing and Manufacturing Union (EPMU). Sumitomo, the company’s Japanese owner, has been trying to sell the plant for two years due to falling demand for wool carpet in New Zealand and the high exchange rate. Canterbury Spinners, a subsidiary of Godfrey Hirst, made a conditional offer to buy the plant at the end of February, provided the business can be made viable. “Sumitomo has treated the people extremely well. The fact that we’re able to negotiate some enhancements to the people who stay till the end is an indication of the good faith that is between both Sumitomo and the employees,” said EPMU’s John Gardner. NZ labour unions fear more workers will be laid off after more than 500 jobs were cut in the latest round of layoffs. Recent job cuts announced at state coal firm Solid Energy will reduce its staff by 25 per cent to 1360 from 1899 at the beginning of 2012. Government-owned KiwiRail, meanwhile, began consultation after confirming that 158 jobs will be eliminated from its infrastructure and engineering division around the country. The Engineering, Printing and Manufacturing Union (EPMU) led a march on parliament last month to protest the closing of Solid Energy’s Spring Creek and Huntly East operations and to plead for a $36 million one-off payout to keep the mines open. The EPMU also told the news media that paper maker Norske Skog is expected to announce soon120 job cuts. In other recently publicised cuts, Rio Tinto’s Tiwai Point smelter will eliminate 100 jobs by November, and North Island Mussel Processors 220 fulltime and seasonal staff. More than 400 primary school teachers from across the country attended New Zealand Educational Institute’s (NZEI) annual conference in Rotorua October 1-4, where they expressed their displeasure over the government’s proposed education standards. Minister of Education Hekia Parata defended the policy changes on national standards, charter schools and league tables but faced heated questions from teachers. NZEI president Ian Leckie said it was unlikely that teachers will favourably accept the new policies. “We’ve got some very different views about what is going to make the biggest difference in New Zealand education,” he said. International experts who spoke at the conference criticised the imposition of national standards, saying they do not work. Pasi Sahlberg from Finland’s Ministry of Education said none of the countries with top performing educational systems have policies in place which the government is proposing. He said Finland got to the top of the rankings doing the opposite of what is now happening in New Zealand. Maori union members and iwi leaders endorsed a call to halt national asset sales and to negotiate water rights. Council of Trade Union Maori Vice President Syd Keepa reported that more than 200 iwi leaders and CTU Maori members attended a one-day assembly (hui) at Baypark on Tuesday, September 18, where they “resolved to both strengthen the relationship between unions and iwi to progress the rights of workers.” Syd said Maori workers and their unions called for the Government to stop assets sales and for iwi to work together to define and negotiate Maori proprietary rights and interests over water. “They strongly urged iwi not to enter into negotiations with the crown until proprietary rights and interests were addressed. This is consistent with the ‘common interest’ recognition dominating the mood of the occasion”, he said. He called the hui “historic” and it also recognised the role iwi leaders in the settlement of the recent dispute at AFFCO. NZ labour unions welcomed the release of the Health and Safety Taskforce’s Issues Paper last month. The Government in April authorised creation of the taskforce to undertake a review of the nation’s workplace safety and health conditions. The Issues Paper identified areas of policy that require change in order to improve the country’s workplaces. “It’s a disgrace that on average 100 people per year are killed at work. If there is something all New Zealanders would agree on it is that every worker who leaves home at the start of their working day should return home safe and healthy. This is a fundamental starting point”, said Council of Trade Union President Helen Kelly. 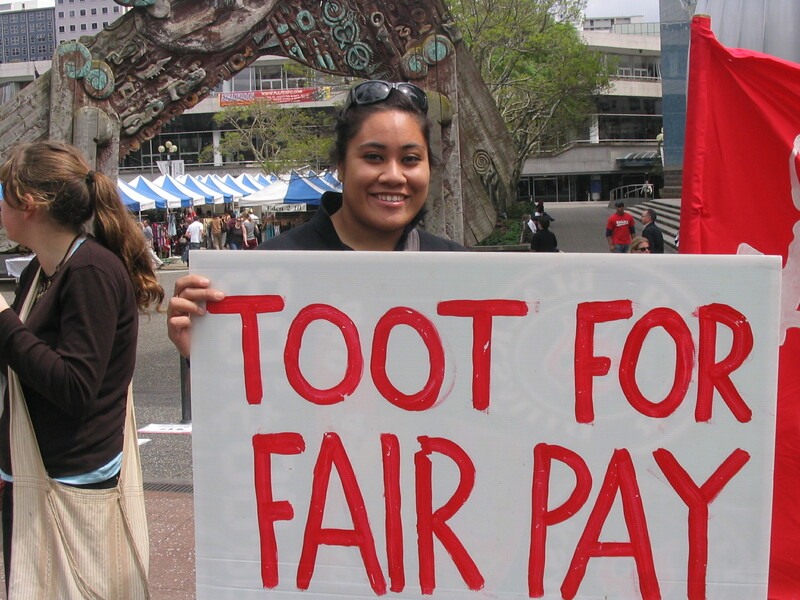 The CTU urged New Zealand families to contact the Taskforce with their ideas and experiences. “We have five times the rate of workplace injury in NZ than that of the UK. Over 6,000 New Zealanders make notifications about serious harm in their workplace each year. The issues paper asks why this might be and what is needed to stop this including considering the role of government, employers, unions and workers as well as the adequacy of the legislation,” she said. The Public Service Alliance of Canada, (PSAC) held a National Day of Action Sept.16 with rallies and events across the nation to raise public awareness of the cuts to public services proposed by the Conservative government. “Canadians from all walks of life are feeling the impact of federal cuts: we’ll be sharing their stories and protesting these cuts,” the union said in a statement. The Conservatives recently announced that about 19,200 federal jobs will be cut in the public service sector over three years as part of their austerity measures. The PSAC said that thousands of jobs could be lost and services drastically reduced. In St. John’s, Newfoundland, for example, a rally and march started at the Murray Premises. In Toronto, union activists held “The People’s Court,” which placed the austerity agenda and political leaders “on trial” for sweeping budget cuts. America’s unions flexed their political muscle during the campaign season augmenting labor’s vaunted ground campaign with social media through new technology and expanding their volunteer base with groups once considered outside society’s mainstream. The AFL-CIO introduced new on-line technology called “Repurpose” which allows volunteers to earn points for their activism which can be “redeemed” to trigger spending by the labor’s Super PAC, called “Workers Voice.” Meanwhile, Pride@Work, the Lesbian, Gay, Bisexual, and Transgender affiliate of the AFL-CIO, themed their annual conference in September “Boots on the Ground” to emphasize their commitment to engage in the 2012 elections. The U.S. election is scheduled for November 6, although early voting in several states has already begun. Tens of thousands of workers, young people, unemployed and retirees took part in demonstrations last month in major cities of Portugal and Spain in response to severe austerity policies. 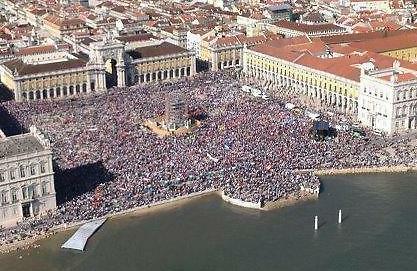 Dock workers also staged strikes in Portugal, where the biggest protests took place. They oppose changes in work rules that threaten jobs. The Portuguese economy was projected to shrink by 3 per cent this year and the official jobless rate is nearly 16 per cent. In Madrid, protesters marched on the parliament building chanting “Fire them, fire them,” in reference to Spain’s right-wing government of Prime Minister Mariano Rajoy. But police sealed off access to the building. Rajoy’s government recently presented a 2013 austerity budget that will cut overall spending by €40 billion, freeze public employees’ salaries and reduce unemployment benefits. In another embarrassment for Apple, Foxconn, maker of iPhones and iPads, shut down production at a factory in China’s northern city of Taiyuan September 24 after a riot by some 2,000 employees at a dormitory injured 40 people. The facility employes 79,000 people. International labour groups pointed to the riot as yet another symptom of employee mistreatment at Foxconn. News reports said the riot first started as a “personal dispute” between a few security guards and workers that quickly escalated. Cars and store front windows were smashed during the melee. Interviewed workers alleged Foxconn’s security guards are often domineering and aggressive toward assembly-line workers. The Taiwanese-owned company is one of Chinas largest employers, with some 1.2 million workers in factories in Taiyuan, the southern city of Shenzhen, in Chengdu in the west and in Zhengzhou in central China. 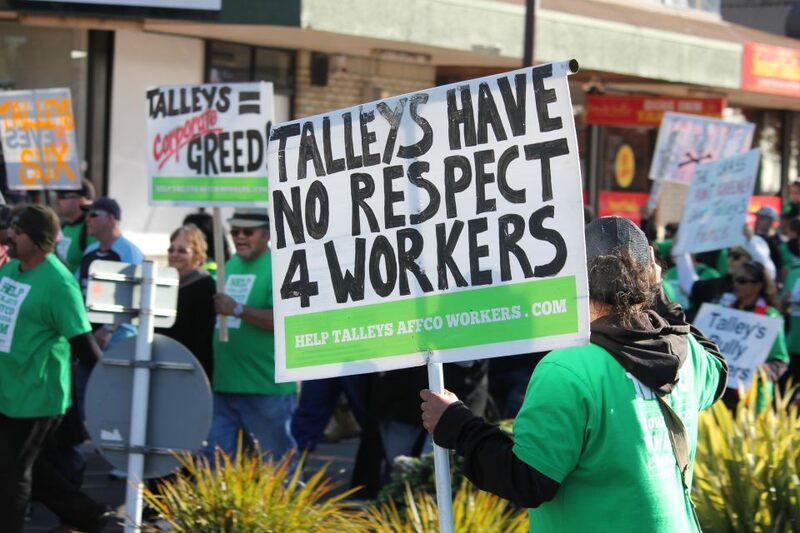 Unrest has occurred at other plants where workers complain of low pay and poor conditions. NZ Bus, the Tramways Union and First Union reached a settlement for a new collective agreement at a “last ditch meeting” September 21, which averted industrial action that could have stranded 130,000 Auckland commuters and 10,000 school children. The agreement was announced in a joint statement by all parties. Drivers for NZ Bus, which operates lines including Metrolink, Go West, Waka Pacific, Northstar and the inner-city Link routes, including school bus services, were planning to strike every Monday for eight weeks over a pay dispute and recent contract and rostering changes. The first job action was planned for Monday, Sept. 24. “We welcome this development and are pleased that the buses will be on the road to carry the travelling public this Monday” said Gary Froggatt from Tramways Union. “Today’s meeting was positive, and we can see a way forward with some unity between the bus unions and the CTU, and NZ Bus,” said Karl Andersen from First Union. Temporary employees who may not be up to speed with operational procedures create unsafe and stressful conditions for wharf workers at the Port of Tauranga, the NZ Maritime Union charged recently. “You’ve got to train them up and it’s really difficult,” Mount Maunganui Tauranga branch secretary Selwyn Russell said. “The sheer workload already contributes to high dangers … and then you’ve got casuals running around on the floors who do not know the standard operating practices.” Russell cited the death of a contract worker in August last year as an example of the dangers of working at the Port. He explained that the permanent staff already faced heavy workload pressures. Working with temporary employees with limited knowledge of the standard operating practices raised the stress and danger levels. “Worrying about whether the person next to them knows what they’re doing … is not helping”, he said. A new survey showing New Zealanders are generally very satisfied with public services should be seen as a tribute to public service workers rather than a justification for current and future cutbacks, said the Public Service Association. The Kiwis Count survey of more than 1,000 New Zealanders conducted earlier this year found high levels of satisfaction with government services particularly through greater access to online transactional services. PSA National Secretary Brenda Pilott said maintaining the high quality of public services has come at a price for workers. "Public servants have been battling the odds with the government’s public service staffing cap leading to the loss of at least 2500 jobs since National took office," she said. She cited serious staff shortages resulting from budget cuts and endless restructurings which have put "huge" pressure on existing staff. "It’s clear that public service workers are working hard to offset the effect of job losses and funding cuts and it would be nice to see the government acknowledging that," she said. The NZ Rail and Maritime Transport Union expressed outrage that the Government plans to spend $12.3 billion on New Zealand’s land transport system over the next three years while expecting the rail industry "to pay its own way" by becoming self sufficient in ten years. "In doing so, the government is expecting rail to compete with a road transport industry heavily subsidised by taxpayers. It’s wrong, and it isn’t going to work," RMTU General Secretary Wayne Butson said. "A modern transport infrastructure for New Zealand means a commitment to a quality rail network as a key part of the logistics supply chain, not just roads." The union said some of the funds, which will come from increases in petrol excise duty and road user charges, should be spent on maintaining the country’s railway network. "No one would realistically expect that road users meet the full cost of the national roading network," Butson said. "But it makes no sense to, on the one hand, heavily subsidise road users, and then to take a totally different approach to rail." 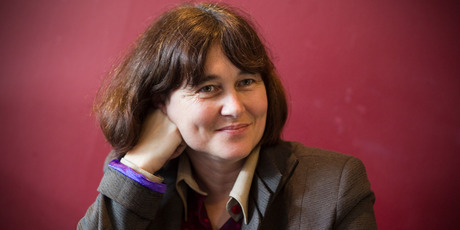 The current decline in workers’ rights and conditions will only change when people’s "deference" to employers and the state is overcome, declared Council of Trade Union president Helen Kelly. 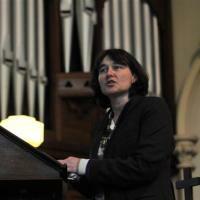 Kelly spoke at a lecture in Otago commemorating the Rev Rutherford Waddell, the 19th century Dunedin Presbyterian minister who inspired social and labour reforms. Kelly told the audience of 200 that conditions have improved for workers since Waddell’s time, but those conditions were on the decline today for many workers. She noted workplace deaths are on the rise, 300,000 workers are at or near the minimum wage and permanent jobs are undermined by contracting-out and casualisation. She said attacks on workers are increasing, and she predicted public sector workers will be the next to be portrayed as "overpaid, lazy and incompetent." 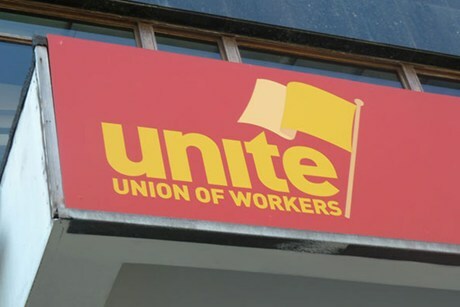 Unite resolved a dispute with Burger King after the union accused the fast food chain of unfairly treating migrant workers and underpaying its staff. Unite national director Mike Treen said the details of the agreement will remain "confidential" but he added the union would recommend that New Zealanders patronize the fast-food chain. Treen said union members would be "very pleased with the outcome". "In addition the parties will work in good faith to promptly resolve any individual employee cases," he said. Treen said the union was "confident" that Burger King was committed to building a positive environment for the workers. A joint union-company notice will be posted in Burger King stores followed by a letter from the union explaining the outcome. 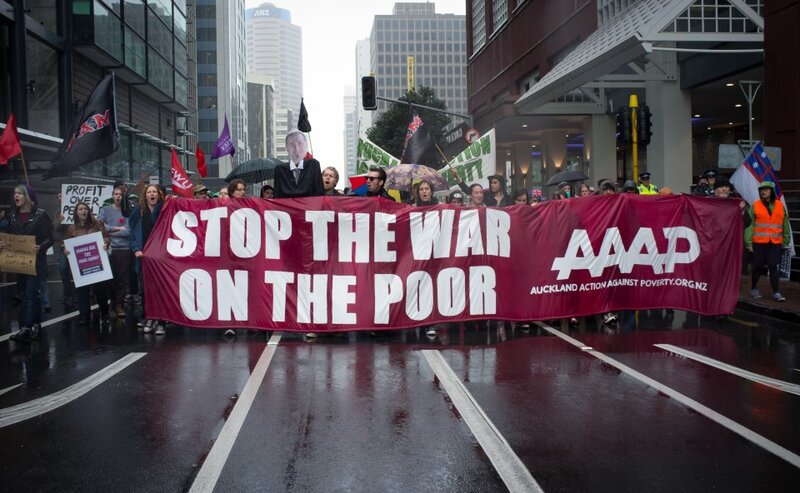 Ministry of Social Development recently released a report that showed inequality in New Zealand is at its highest level ever. The report also shows that the average income has fallen for the first time since its low point in the early 1990’s. Meanwhile, the Labour Cost Index last month revealed a 0.5 per cent increase in the three months prior to June, indicating that wages and salaries are no further ahead compared to inflation than they were six months ago, and 2.5 per cent behind where they were in March 2009. LCI statistics showed that only 56 per cent of workers received a raise to address the cost of living or market relativities in the last year. 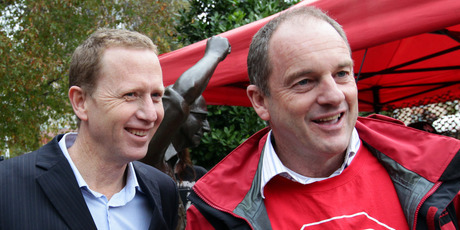 The combination of income reports gave impetus to labour’s campaign to raise the minimum wage to $15 and to the Living Wage Campaign. The Service and Food Workers Union’s Living Wage campaign picked up key support as several leading members of the Green Party joined the effort. Green Party industrial relations spokesperson Denise Roche last month said a living wage is needed because of the growing gap between rich and poor in New Zealand. She, along with other Green MPs, including Co-leader Dr. Russel Norman, joined the Aug. 30 launch of Living Wage New Zealand in Wellington. (Labour Party has long supported the living wage.) The union explained that the campaign focuses on combating poverty through advocating for better pay rates for low paid workers. "The minimum wage at $13.50 is too low. It needs to be based on what people actually need in order to have a decent life, not on the whim of cabinet and business," said Ms. Roche. She said the recent "small increases" in the minimum wage under the National Government have "done very little" to help New Zealanders make ends meet. "Many of those on the minimum wage work long hours and extra shifts to make ends meet. Lifting wages for these workers would make a huge difference to the quality of their lives," said Ms Roche. The Labour and Green parties, Grey Power and the Auckland University Students Association pushed forward on plans to collect enough signatures to force a non-binding referendum on the sale of state assets. But Prime Minister John Key said the partial asset sales will go forward regardless of whether or not opposition parties gather enough signatures for a referendum. "We had the biggest referendum we’re going to have – which was the general election … Partial asset sales was the major issue that was debated during the election campaign and National got an overwhelming majority going to the public with that policy," Key said. Labour Party leader David Shearer warned that outstanding issues involving several state-owned enterprises due to be partially sold could set back the sale process. He noted Solid Energy, for example, recently reported a $40.2 million loss and Maori water rights issues involving Mighty River Power are unresolved. Members of Australia’s Construction, Forestry, Mining and Energy Union (CFMEU) last month walked off their jobs and blocked the entrances to construction sites in a dispute with developer Grocon. 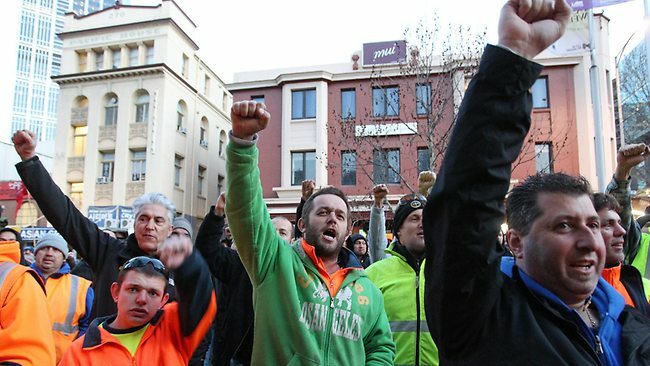 In Melbourne, police confronted some 1,000 CFMEU members as they escorted Grocon employees past picket lines to their offices. Another 200 workers in Sidney struck as part of the dispute. NSW union organiser Darren Taylor said a key part of the Melbourne dispute was about the appointment of shop and safety stewards to represent the workforce. The workers in Sidney reportedly wanted to show solidarity with Melbourne workers and also to highlight safety issues at their worksite. Recent mediation by Fair Work Australia has failed to resolve the dispute. CFMEU Victorian president Ralph Edwards, meanwhile, said the blockade would continue until all of the issues were resolved. 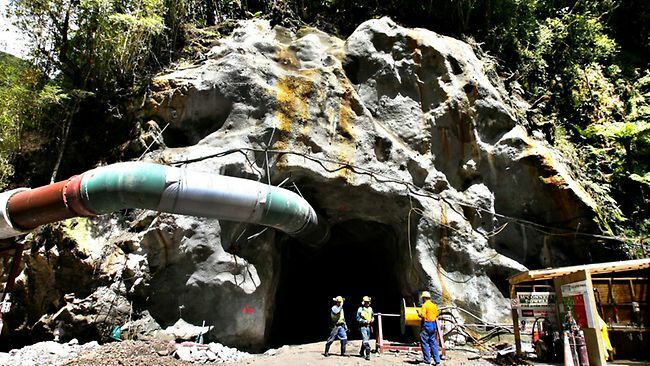 Fiji Mine Workers Union reported that former Vatukoula goldminers who have been on strike for the last 21 years have yet to receive any resolution of their grievances despite promises of redress. The union made submissions to the country’s Constitution Commission in Vatukoula on August 31. "The reason we are making these submissions to the commission is because in 2007, when the current government took over, we were promised resolution of our strike by the government representatives at a meeting held at the Fiji Human Rights Commission on 23rd April 2007," said union president Josefa Sadreu. But he said no action was taken despite repeated requests seeking updates. In 2009, the Fiji Mine Workers Union formally withdrew the case from the Human Rights Commission and sent the complaint directly to the International Labour Organisation in Geneva. 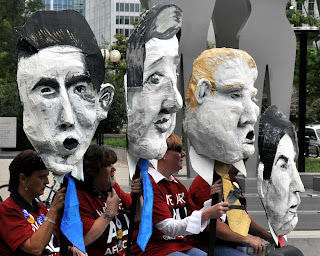 The USA’s AFL-CIO used Labour Day, a national holiday, to launch Labour 2012 political action campaign in support of re-electing President Barak Obama and other labour-endorsed candidates. Workers celebrated the event with parades, rallies, picnics and demonstrations across the nation. According to the AFL-CIO, the Labour Day campaign is part of a broader, long-term initiative by America’s unions to send the message that "Work Connects Us All" and "to help provide a voice for all people who work." Working families participated in a national grassroots canvass across the country prior to the Republican National convention held Aug. 28-30 and visited an estimated 640,000 homes in 23 states. "Working families talking to their neighbours, co-workers, friends and families is kryptonite to the radical right wing agenda," said AFL-CIO President Richard Trumka. "We’ll be breaking through the noise of misleading ads paid for by wealthy special interests, and letting voters hear from the people they trust most on the economic issues they care about. That’s how working families will win this election and lift up the middle class." Restorers of historic Angkor Wat signed their first collective agreement on August 31. The pact should set a precedent for Cambodia’s construction industry, union supporters said. More than 120 workers, who formed the Angkor Preservation Workers Union in 2010, led a two-year campaign for insurance that would cover injury and illness, union rights, wages and other benefits before their employer, the World Monuments Fund (WMF), agreed to the pact which also increased wages from $79 to $90 per month.. The WMF, based in New York, has been in Cambodia for more than 20 years and preserves the iconic Angkor Wat and other temples such as Phnom Bakheng and Preah Khan. "This is such an important day. We’ve witnessed a big international organisation sit down with a small independent Cambodian trade union," said Dave Welsh, country director of the American Centre for International Labour Solidarity, which supported the workers’ efforts. Fifty Massey University cleaners have the right to bargain for non-monetary redundancy entitlements with international cleaning company OCS despite their contract excluding them from redundancy payments, the Supreme Court ruled last month. The court said such entitlements could be training or job seeking assistance. The decision was a clear victory for the workers and the Service and Foodworkers union which filed the suit. The union explained that OCS slashed the cleaners’ hours in 2010 after it won a contract to clean the university’s Palmerston North and Wellington campuses. ”They gave the cleaners notice that their working hours would be reduced to 27 a week and their working year cut to 31 weeks,” union national secretary John Ryall said. According to the union, OCS sacked them when the cleaners asked for redundancy entitlements and only reinstated them when they signed up to the new hours of work. ”The Supreme Court victory is very important, not just for the Massey University cleaners, but for vulnerable workers throughout New Zealand," Ryall said. A proposal by the Canterbury Employers Chamber of Commerce to sell off Christchurch City assets to help fund the Christchurch rebuild was soundly rejected by New Zealand’s unions. Marty Braithwaite, the unions’ earthquake recovery spokesperson, said the commercial returns from assets such as the Lyttelton Port Company, Orion and the Airport had been instrumental in ensuring that rates for Christchurch residents have remained some of the lowest in the country. He said the Chamber of Commerce’s call was "short-sighted." Braithwaite said that unions would oppose the sale or partial privatisation of strategic assets, adding that the assets had been built up by generations of ratepayers and would continue to make an important economic and social contribution to the city. In submissions to both the Christchurch Central City Plan and the Canterbury Earthquake Recovery Authority Draft Recovery Strategy, the unions argued that the revenue generated by CCHL would be more important in the future than ever before. The NZ Engineering, Printing and Manufacturing Union warned the Government that more good jobs will disappear unless a new jobs strategy is put into place. The recent closure of the high-end manufacturing firm Flotech, which will result in more than 70 redundancies at Flotech’s Manukau plant, follows similar mass redundancies at Summit Wool Spinners in Oamaru and Norman Ellison Carpets in Onehunga. “This is the third major factory closure in as many weeks. It’s time the government realised that its hands-off approach isn’t working,” said EPMU assistant director of organising Strachan Crang. He said the government needs to support manufacturing if it’s serious about protecting well paid, highly skilled jobs. “Unless the government is willing to step up with a plan to help manufacturing firms through the downturn, we’re just going to see more good jobs like these disappear,” he warned. EPMU said that all members affected by the job losses will receive a redundancy package as part of their collective agreement. First Union (Finance, Industrial, Retail, Stores and Transport) transport and logistics secretary Karl Andersen called for law changes to stop unsafe practises by truck drivers on New Zealand’s roads. The union charged that some truck drivers are engaging in unsafe practices such as taking shortcuts and using stimulants. Andersen said owner drivers are under “immense pressure” to make a living, many were tied into contracts their boss could change at will and demands could not be met without compromising the safety of themselves and other road users. “This leads to drivers taking shortcuts, running bald tyres, breaking driver regulations and, in some cases, using stimulants to get through,” he said. “Drivers work very long hours and face significant disruption to their family time. They shouldn’t also have to work in an unsafe environment and put themselves and others at risk.” According to Ministry of Transport national figures, 57 people died and 871 were injured in road crashes that involved trucks in 2010, 15 per cent of the total road toll even though trucks made up only about 6 per cent of the road traffic. Teachers’ unions urged schools to refuse to release national standards data to the media to prevent the information from being unfairly reported. Union leaders said schools should not individually give results to the news media and should instead refer any requests for the information to the Education Ministry. The ministry declined a request for data from the Dominion Post, but acting senior manager Dennis Cribb said individual schools could be approached. “We are entering a new era of ‘naming and shaming’ schools in order to sell newspapers and even worse, the publication of league tables will be unfair and based on faulty, misleading and valueless misinformation,” New Zealand Educational Institute (NZEI) president Ian Leckie said. In an “urgent” advisory, NZ Principals’ Federation president Paul Drummond also suggested schools should “consider reporting in general terms” to prevent misinterpretation of the data. The NZ Maritime Union supported heavy criticism of New Zealand in a U.S. Government report on the NZ fishing industry’s use of overseas labour. The U.S. State Department’s “Trafficking in Persons Report 2012”, released in June, identified areas “of strong concern for human trafficking in New Zealand” including the use of overseas labour in the fishing industry. The union said the criticism was “justified.” “This report confirms and vindicates the stance of the Maritime Union that the deregulated industry and exploitation of overseas labour has been a stain on New Zealand’s reputation. The Maritime Union has been pushing for action on this issue for a decade,” said Maritime Union of New Zealand General Secretary Joe Fleetwood. The report charged New Zealand was a destination for foreign workers, who are subjected to forced labour and other abuses on fishing boats and in the agricultural sector. 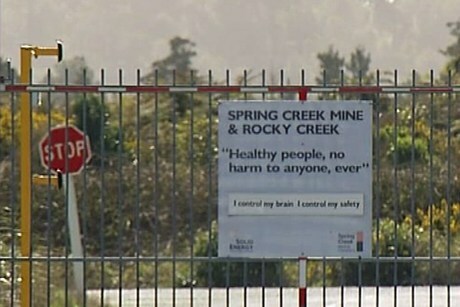 Workers at Solid Energy’s Huntly East underground coal mine demanded the company agree to Australian mine safety regulations, including worker-elected check inspectors. Represented by the NZ Engineering, Printing and Manufacturing Union, the 120 workers called for called for a system of worker-elected check inspectors, which is a key part of Queensland’s mining regulations. The Queensland regulations are considered the international best practice in mine safety, the union says. “Solid Energy can’t credibly claim it supports lifting New Zealand’s sorry mine safety regulations to international standards while it refuses to allow check inspectors and lobbies against law changes to make them compulsory,” EPMU assistant national secretary Ged O’Connell said. Solid Energy, a state-owned miner, has taken over the Pike River Coal mine on the West Coast of the South Island where 29 workers died in an explosion. The company opposes a mandatory role for worker-appointed check inspectors. The NZ Council of Trade Unions said in a statement that “action” must be taken to stem the exodus of workers to Australia. Statistics NZ recently reported that 53,400 people left permanently or long term for Australia in the year ending May 2012 which serves as “a stark reminder to employers and the Government that we need to create more decent jobs in New Zealand,” said CTU Secretary Peter Conway. “Action needed includes a lift in the minimum wage, and a lift in wages in general through improvements to collective bargaining, including the development of industry-wide agreements, and renewed efforts to lift productivity and share the benefits with workers,” he said. Conway pointed out that the steady outflow at a very high level also shows that the 2010 tax cuts which gave $2.2 billion to the top 10 per cent of income earners was not only grossly unfair but has made Australia even more attractive for many New Zealand workers. Faced with an open rebellion from teachers’ unions and the public, New Zealand’s National Party-led government in June dropped plans to increase class sizes throughout public schools. The government had proposed to increase the student-teacher ratio from 23 to 27.5 over the next ten years as a way to cap the numbers of teachers. Teachers and school communities had been joined by parents and students in bitterly denouncing the move. The cuts were part of the government’s “zero budget” in May, which froze expenditures and deepened attacks on public services. The announcement sparked an outcry from educators, parents and students. Polls showed 80 per cent opposition to any increase in class sizes. For the first time since it assumed office in 2008, the government began losing substantial poll support to Labour and the Greens. On June 7, Education Minister Hekia Parata suddenly announced that the class size increases would be rescinded. New Zealand faces an acute shortage of skilled labour, said a recent Department of Labour report. Even though New Zealand gained 1,500 more skilled workers than it lost last year, acute shortages still exist in some trades. According to the Department of Labour, skilled jobs where shortages exist include drainlayers, fibrous plasterers, metal fabricators and crane, hoist or lift operators. More professions also are likely be added to the long-term list such as engineering and mechanical trades and truck drivers. The report explained that some deficits are an aftershock of the Christchurch quakes, others due to the brain drain. Most projected skills shortages are in jobs for the Christchurch rebuild. The projected skill shortages are likely to impact immigration policy as pressure builds to ease entry rules for foreign workers. New Zealand government workers are the most demoralised about their jobs than at any time in a least six years, according to the April-June Westpac McDermott Miller Employment Confidence index. The Public Sector Employment Confidence Index sank 3.8 points to 89.7, the lowest since the public sector measure was started in March 2006. Readings below 100 mean pessimists outnumber optimists. “Public sector employees are caught in an on-going process of public sector restructuring and job losses,” said Richard Miller, director of strategy planning consultancy at McDermott Miller. “Job security is shaken within their sector while opportunities outside are few and far between.” Private sector employees remained optimistic, even with a 1.1 point drop to 100.5, still the lowest reading since June 2009. Overall, the index fell to 96.2 in the April-June quarter, from 98.9 three months earlier, the fourth straight quarterly decline. The International Trade Union Confederation (ITUC) strongly condemned raids on union offices and arrests June 25 of seventy-one trade union leaders and members who were detained by the Turkish government. According to the ITUC, the pretext of the attacks was an operation against an illegal terrorist organisation, although no links between Turkey’s trade unions and “any real or perceived” terrorist group has been found. “We cannot accept that trade unionists are detained, jailed and, most of all, baselessly accused. 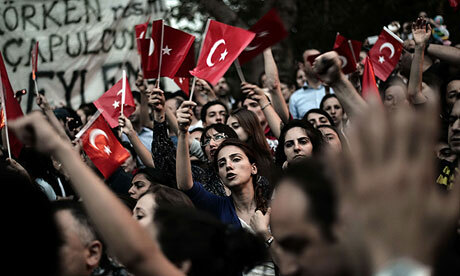 The Turkish government must immediately stop labelling trade unions as terrorist organisations. Trade unionists should have the right to play their legitimate role without fear of being arrested,” said Sharan Burrow, ITUC General Secretary. Last year, 25 members of teachers’ union Egitim Sen were sentenced to six years’ and five months’ imprisonment by the Izmir Criminal Court as “terrorists.” The only “evidence” against them included possession of books that can be found in any bookstore in Turkey, and the holding of union meetings. Thousands of striking Argentine truckers and other union members staged a one-day strike June 27 to demand the state cut back income taxes to improve wages amid inflation which is running about 25 per cent annually. They also demanded better treatment from the executive branch. The action was called by the powerful General Labour Confederation union, which was once a close ally of President Cristina Fernandez and her late husband, former President Nestor Kirchner. “It wouldn’t cost Mrs. President anything to … talk to workers,” said union leader Hugo Moyano at the rally in Buenos Aires. He added that he hoped Fernandez would “realize that she can’t continue with this overwhelming haughtiness.” The workers gathered in front of Argentina’s presidential palace in Plaza de Mayo in an action that is seen as a challenge to Fernandez. 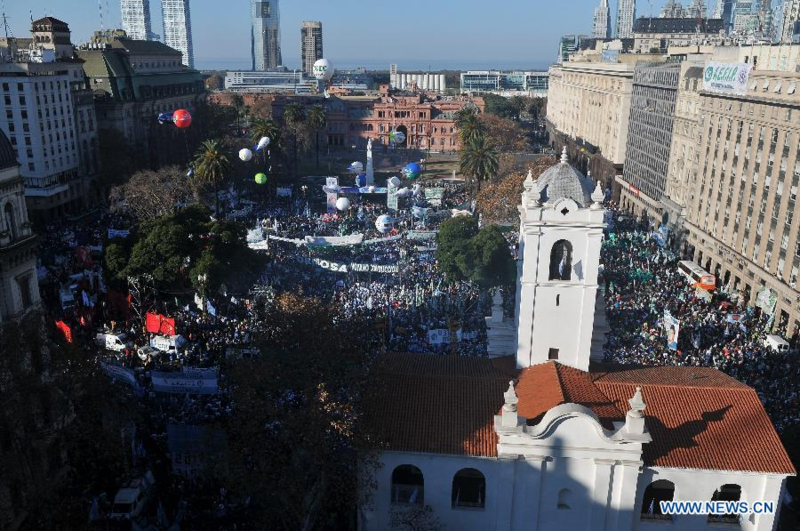 The demonstration was the first time the labour federation, an umbrella group for numerous unions, has called a strike since Nestor Kirchner took office in 2003. Below is the latest edition of the New Zealand Labour Letter published by AIL. AIL of NZ offers our congratulations to members of the NZ Meat Workers Union for successfully reaching a new settlement with Affco. We are proud to have supported the workers during this difficult 12-week struggle. Details of this story are reported in this month’s edition. This online newsletter is published as a service to Labour by AIL of New Zealand Ltd. Your subscription is provided at no cost to you. Please encourage your colleagues, members and co-workers to register for their no-cost subscription to the New Zealand Labour Letter at www.ailnews.com. The New Zealand Labour Letter is part of the growing family of international Labour newsletters published by AIL which include the U.S. Labor Letter and the Canadian Labour Letter. 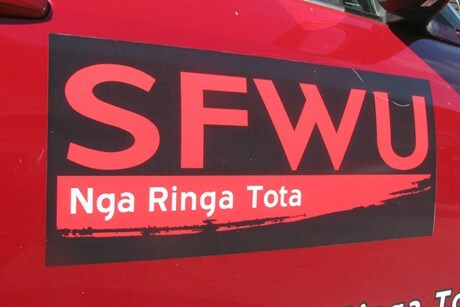 The New Zealand Meat Workers Union and meat processor Affco settled on a new collective agreement May 22, ending a bitter 12-week industrial dispute. ”The settlement secures the core issues of concern to our members. It retains protection of wages and employment security and ensures workers continue to have their terms and conditions set by a union negotiated agreement,” Union president Mike Nahu said. Nahu later told the news media, “From our point of view we’ve got the union protection and issues that we wanted addressed for our members. From the company’s point of view, they’ve probably got a wee bit of the flexibility they wanted in terms of the agreement.” The dispute rallied New Zealand labour to the workers’ cause and attracted international labour support. The union and management credited the involvement of Tainui head Tuku Morgan, Ngapuhi chairman Sonny Tau and Wanganui activist Ken Mair for achieving progress in the dispute. 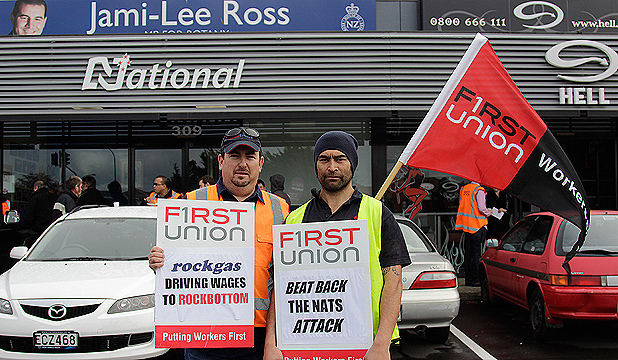 Maori comprise about 75 per cent of union membership at plants affected by the industrial turmoil. Maritime Union of New Zealand called for “a complete overhaul” of New Zealand’s shipping policy to avoid a repeat of the Rena disaster. The union’s General Secretary Joe Fleetwood said deregulated Flag of Convenience shipping is the main problem. “The approach for the last generation has been for Government to abdicate its responsibility to ensure standards in the maritime industry,” he said. Rena-style incidents were “almost guaranteed” as long as Flag of Convenience shipping was given a “free ride” in New Zealand waters, Fleetwood asserted. “The surprising thing is how long it took for a shipping disaster of this type to happen, not that it did happen.” Fleetwood said the Australian government has passed a series of bills to regenerate Australian owned and Australian crewed shipping. He said the reintroduction of cabotage (giving priority to New Zealand owned and crewed shipping) is back on the agenda following Australia’s actions. New Zealand labour described the National government’s recently introduced budget as “austerity-lite” that risks sending the economy back into recession. Council of Trade Unions Economist Bill Rosenberg warned the “zero budget” is based on the “same failed logic” of austerity that is being rejected in Europe. He said “you can’t have growth and austerity, it just doesn’t work. With government debt still among the lowest in the OECD, it had room to move with real investment in job creation, economic growth, and looking after those who are most vulnerable.” He warned that the proposed tax increases will only raise $289 million in the next fiscal year and fails to address the loss of revenue from the 2010 changes that cut taxes for the rich while increasing the GST, which hit working families hardest. “We’ve seen high GDP growth forecasts time and again, but they have never actually showed up. Instead we have seen unemployment exceeding forecasts, lasting longer and affecting more people,” he warned. Education sector groups met recently to coordinate action following the Government’s budget announcement that new teacher-student ratios in schools will increase to one teacher to 27.5 students beginning in 2013. The groups include the NZ Education Institute, NZ Association of Intermediate and Middle Schooling, NZ School Trustees, Post Primary Teachers Association, New Zealand Principals’ Federation, Secondary Principals’ Association of NZ, and the PPTA Secondary Principals Council. “The outrage has been building throughout the education sector at the decision to cut frontline teaching staff despite the election promise that this would not happen,” the groups said in a joint news statement. “Principals, teachers and parents are incredulous that despite the concerns about the effect of increased class sizes on the quality of our public education system, the Government has not withdrawn its flawed policy.” The group seeks to mobilize teachers and parents to pressure the government to reverse its Budget decisions. The Engineering, Printing and Manufacturing Union is considering demands to have guarantees of earthquake building safety written into collective employment contracts. Delegates will vote on the proposal in July. The union wants employers to prove that their buildings meet the earthquake code and to take corrective actions if they don’t. EPMU national secretary Bill Newson said people have the right to a safe workplace and the union is not ruling out striking if necessary. “We’re not all about to walk off the job and declare World War III over this issue. But certainly if employers haven’t done the assessment, won’t do the assessment, then we’re going to have to make it the subject of a formal claim in bargaining,” he said. The union noted that the devastating earthquakes in Canterbury and the Pike River tragedy revealed to workers how unsafe some workplaces are. The New Zealand Union of Students’ Associations criticised the National government’s decision to cut support for students “so it can pay for its tax cuts for the rich”, said the group’s President Pete Hodkinson. “This is a re-run of the last National government in the late 1990s which also cut student support as it cut taxes”, he said. The government recently announced that for 2012/13 it would not be shifting the parental income thresholds at which allowances are abated, and has fixed the student loan repayment threshold at $19,084 until 2015. “The inevitable consequence of not lifting the repayment threshold is a tighter squeeze on those that can afford it the least. And frankly that’s just wrong”, said Hodkinson. New Zealand’s economy will struggle over the next two years and remain stagnant, predicted a major think tank. “There is little economic growth and the outlook is challenging,” New Zealand Institute of Economic Research (NZIER) Principal Economist Shamubeel Eaqub said in the group’s Quarterly Predictions report. NZIER attributed the nation’s economic woes to delays to the Canterbury earthquake rebuild, reluctant consumers, slowing growth in major trading partners, and sluggish investment. The country is going through a period of paying down debt, and along with a weak labour market, anaemic wage growth and consumer demand would combine to limit growth to around 1.5 per cent in 2012, the group said. “Low interest rates are not encouraging new borrowing and investing, as we pay down debt or deleverage,” said Eaqub. The Institute predicted growth would pick up to 2.5 per cent in 2013, little changed from its first quarter forecasts, and 2.4 per cent the year after. A new report from the International Labour Organisation found the transformation to a greener economy could generate 15 to 60 million additional jobs globally over the next two decades and lift tens of millions of workers out of poverty. The study “Working towards sustainable development: Opportunities for decent work and social inclusion in a green economy,” was led by the ILO’s Green Jobs Initiative. The report said, however, these gains depend on whether the right set of government policies are put into place. “The current development model has proven to be inefficient and unsustainable, not only for the environment, but for economies and societies as well”, said ILO Director-General Juan Somavia. “We urgently need to move to a sustainable development path with a coherent set of policies with people and the planet at the centre.” The report found that while changes will be felt throughout the economy, eight key sectors are expected to play a central role and be mostly affected: agriculture, forestry, fishing, energy, resource-intensive manufacturing, recycling, building and transport. Despite pledges to halt labour violations, working conditions have barely improved at Foxconn’s gargantuan Chinese factories that assemble Apple products, said workers’ rights activists and employees. Hong Kong-based labour watchdog group Student & Scholars Against Corporate Misbehaviour (SACOM) issued a new report May 31 which found rights violations “remain the norm” including high production targets, inhumane treatment and signs of overall salary cuts. The report was based on visits to several Foxconn factories and 170 worker interviews. “The frontline management continue to impose humiliating disciplinary measures on workers,” the report said. “The above findings demonstrate that Apple and Foxconn have not turned over a new leaf.” Foxconn Technology Group, Apple’s main global contract manufacturer run by Taiwanese tycoon Terry Gou, employs 1.2 million workers in China. The firm has come under fire in recent years for running massive “sweatshops” to mass produce high-end iPads and iPhones. Persecution of trade unionists remains a problem in El Salvador even though the country is governed by a left-wing party that advocates labour rights, union leaders report. “People are still fearful of organising or strengthening trade unions,” Róger Gutiérrez, a leader of the Federation of Independent Associations and Unions of El Salvador (FEASIES), which has 10 member organisations, told international labour groups. He noted that during the 1980-1992 civil war, which left a death toll of 80,000, far-right death squads abducted and murdered political opponents, including many trade union activists. Gutiérrez said the greatest problems are in the private sector, where unions continue to be repressed because they are seen as harmful to free enterprise. In certain business sectors, such as textile factories assembling goods for export under the duty-free “maquila” system, dismissals of trade unionists or the setting up of parallel pro-employer unions are particularly common. In Australia, some 800 Fairfax Media staff, employed by newspapers such as the Sydney Morning Herald, Melbourne’s The Age and the Australian Financial Review, staged a 36-hour strike beginning May 30 to protest job cuts. Staff at the Canberra Times joined the industrial action the following day. Fairfax recently eliminated 66 sub-editing and other editorial production positions at two major regional newspapers, the Newcastle Herald and the Wollongong-based Illawarra Mercury, as well as several smaller local publications. The company intends to contract-out the work for its Newcastle and Wollongong regional newspapers to a facility in New Zealand. Last year, the company eliminated 90 sub-editing and other jobs at Sydney Morning Herald and The Age, and shed more than 260 production jobs at Fairfax printing plants in both Australia and New Zealand. Similar to media in other countries, the newspapers have suffered significant drops in circulation and advertising revenues as more people turn to on-line sources for information.